Geotripper: How Did Fish Get into the Desert of the Basin and Range Province? How Did Fish Get into the Desert of the Basin and Range Province? 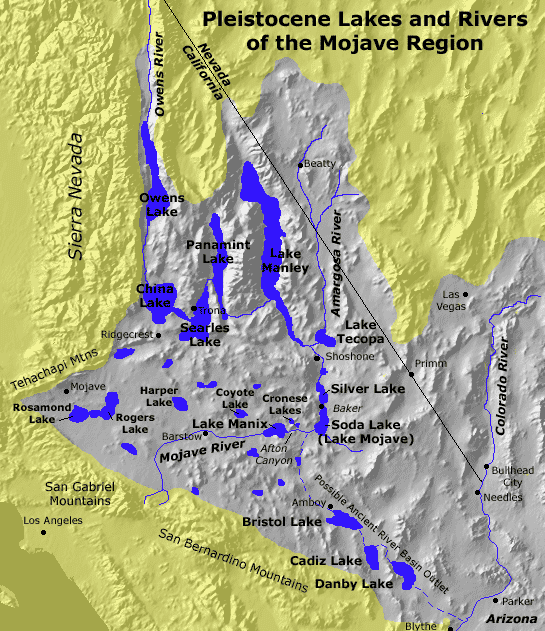 Source: "Pleistocene Lakes and Rivers of Mojave" by Philip Stoffer (14 January 2004). Changing Climates and Ancient Lakes (.html). Desert Landforms and Surface Processes in the Mojave National Preserve and Vicinity. USGS, US Department of the Interior. Retrieved on 2009-09-12. - http://pubs.usgs.gov/of/2004/1007/images/glaciallakes.gif. Following a pair of posts that mention fish in the desert (here and here), I received a comment asking where the connections were that allowed fish to make the journey from the Colorado River system into areas as isolated at the Owens Valley and Death Valley. Courtesy of Philip Stoffer of the U.S. Geological Survey, here is the map. The drainage through Danby, Cadiz, and Bristol Lakes is the probably route of numerous fish species during the ice ages. From there, they were able to move through Soda and Silver Lakes into the Death Valley-Owens River system. It is an unexpectedly diverse group of fish. According to this report, there were 56 species and 75 subspecies of fish living in the Basin and Range/Mojave Desert provinces. Ten of these historically known species/subspecies are extinct. Another 75 are listed, are candidates for federal listing, or are species of concern. 9 out of 10 of the subspecies are endemic, meaning they are found nowhere else in the world. The fish include the highly endangered Devils Hole Pupfish, the popular Lahontan cutthroat trout, as well as a variety of dace, chubs and suckers. The story of why they are endangered is easy to summarize. They need water to survive, and so do humans. It is the choices that humans make that will determine the future of this fascinating group of fish. The Owens pupfish (Cyprinodon radiosus) would be extinct today but for the intervention of a Fish and Wildlife officer who carried the worlds entire population (800 individuals) out of a drying pond in two buckets, and established the fish in six other localities (four of these remain). The Devils Hole Pupfish in Death Valley National Park exist today because of a Supreme Court decision halting the drilling of groundwater near the only pool in which they exist. 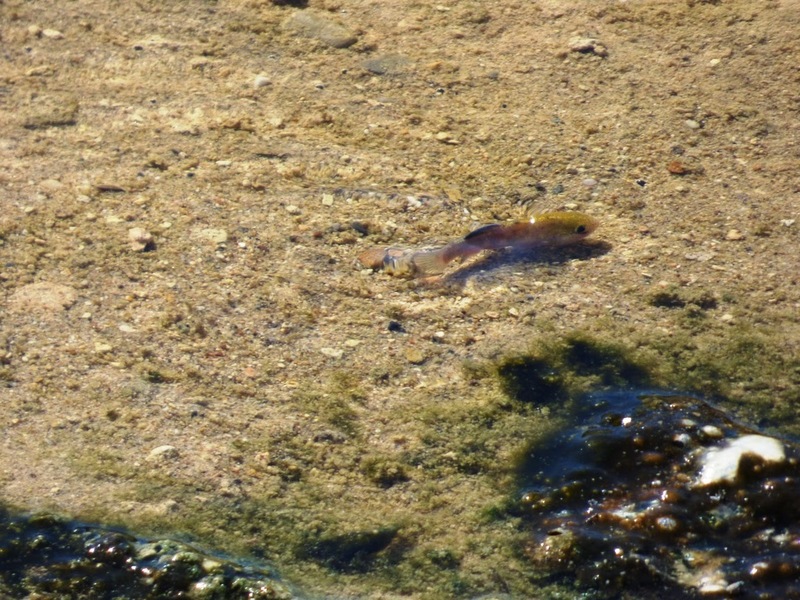 A Death Valley Pupfish, found in Salt Creek on the floor of Death Valley. Curious... It looks like the southern part of Searles Lake might have covered part of the Garlock fault. I wonder if the lacustrine sedimentary record has been trenched to see if it records useful paleoseismic information? Well,well, well. CalTech folks were all over that question, Ron. Thanks for the information "anonymous"! Agreed! Thank you very much "Anonymous". Did you have prior knowledge of this thesis or did you discover it via a search? Just a cursory search after your question piqued my curiosity.